Line your tables with Silver Table Covers and have your guests be as happy and optimistic as the phrase 'every cloud has a silver lining'. With an elegant shine at a low cost, you won't be able to stay away from silver! Light and easy on the eyes, Silver Table Covers make for a great foundation for any theme. Pair these up with any of our disposable tableware sets and use them at your next barbecue, birthday party or holiday party. From gold plates for a metallic theme to hot pink napkins that will stand out from the silver, the possibilities are endless. Silver Table Covers will keep your tables looking good and allow for a quick and easy cleanup the next day. All you need to do is throw them out! 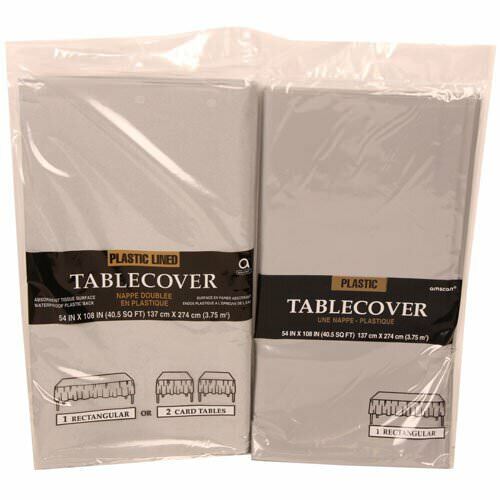 Silver Table Covers come in both paper and plastic and are available in a large 54 x 108 rectangular size. Love the Silver and want to keep with the theme? Check out our Silver Disposable Tableware which can be found on top of the page.